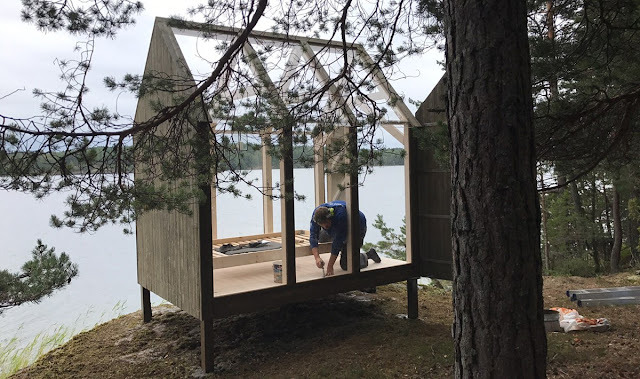 An intriguing project from Visit Sweden, the 72 Hour Cabin is analysing the effects of living in a tiny house/cabin for just three days. Five people with stressful jobs (including a taxi driver, police officier, and broadcaster Ben Fogle) are enjoying what the organisers describe as a "close to nature" lifestyle - swimming, fishing and cooking - while their stress levels, problem-solving and creativity are measured by researchers rom the Karolinska Institute in Stockholm. Their homes for the experiment are custom-built cabins made of glass and sitting on pillars on Henriksholm Island, which is mostly forest with significant grazing for highland cattle. They have been designed by Jeanna Berger who is studying to become an architect in Sweden.